One for China, one for everyone else. We’ve made friends and swiped lovers we never would have met. We’ve learned more about our world and found strange pockets full of weirdos to call home. We’ve truly connected with new ideas and been harassed by nazis with anime avatars who we never would have known existed. The internet has given us so much. But now that era of global connectivity and togetherness may be coming to an end. That’s according to former Google CEO Eric Schmidt, a technical advisor to (and former CEO of) Google’s parent company Alphabet. In the coming decades, Schmidt suspects there will be two major internets out there — the one we know and love/hate, and a new, more heavily-censored one built by the Chinese government. I think the most likely scenario now is not a splintering, but rather a bifurcation into a Chinese-led internet and a non-Chinese internet led by America. Schmidt’s concern for the dangers of online censorship is a direct contrast from the views of his successor, current CEO Sundar Pichai. As CNBC mentioned, Pichai is excited for the chance to further develop partnerships with the Chinese tech industry. 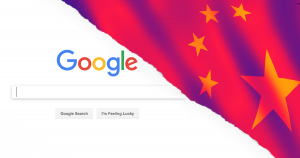 Even after the internal and public backlash against Project Dragonfly, the Chinese government-approved search engine that would make widespread censorship simpler than ever, Google’s leadership is holding onto this neutral, opportunistic stance. Chinese activists may once more be on their own when it comes to disseminating information that the government doesn’t want out there. A separate internet with which the Chinese government can do whatever it wants means a lot more than separate Google search results and restricted social media. Firewalls can be penetrated and servers can be hacked, but a separate internet altogether would cut Chinese people off from the rest of the world, and the rest of the world from its people. CDC Director: There Are No Banned Words at the CDC. Period.